Relax the Cold Away: Reflexology Made Easy With NYC’s Top Spa’s April Special! A recent therapy gaining popularity in New York’s relaxation-and-mediation-oriented society, is that of Reflexology Massage Treatment, though the scientific and medicinal benefits of Reflexology began developing as early as 5,000 years ago. At Manhattan’s Dyanna Spa, we recognize that the healing powers of reflexology are unique as a means of alleviating tension. In an effort to ensure that all of our customers get the chance to benefit from Reflexology, even if they don’t have the time or necessarily the money to spend on extensive massage treatments, we have incorporated ten minutes of the treatment into our Black Currant Mani+Pedi April Special. For just $50, you can receive both a spa manicure and pedicure, and ten minutes of the ultimate Reflexology healing treatment. 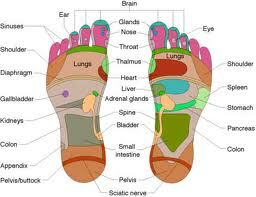 Reflexology Massage is based on the idea that a map of the entire body is located in one’s foot. That is to say, that each muscle, sinew and organ contained in the body corresponds to an area on the sole of the foot. Reflexologists can spend years studying this map, in order to know how to heal a person using the correct pressure points found on their feet. When one comes to a reflexologist with a backache, stomach problems, a caught muscle or any other discomfort, the specialist can heal the pain by concentrating on the corresponding regions of the feet linked to the ailing body-part. A true Master Reflexologist will be able to determine the situation of one’s physical weaknesses without being told, but rather through simply touching one’s feet and feeling for inconsistencies between the pained person’s feet, and the feet of a perfectly healthy person. To book your appointment, visit http://dyannaspa.com or call us at (212) 995-2355! New York Spa Week is Spa MONTH at Manhattan’s Dyanna Spa- All April Long! New York Spa Week is fast approaching and your favorite Manhattan spa decided we need to extend the week into a month again! We worked endlessly to find the newest age-defying treatments and bring you a spectacularly affordable five star experience. NYC doesn’t make skin care easy with the extreme changes in weather, so our team at Dyanna Spa has made sure you will leave rejuvenated in time for spring. Now that’s something to look forward to on a gloomy March Day! To schedule your spa week appointment anytime throughout the course of April 2011, simply call Dyanna Spa at (212) 995-2355 or book online at http://DyannaSpa.com!